I try to get out and run 3-4 times a week down by Mission Bay as there is a nice path and I don’t have to be afraid of vehicle traffic. I used to run on the sidewalk where there was one and on dirt when there wasn’t; however with traffic whizzing by at 55 mph (speed limit is 45 mph), I got smart and decided that I’d just drive to a nice place and run. Last year on one of my runs, I noticed electric scooters parked in groups along the path. Over the course of the next few months, the scooters started appearing just about everywhere I went in the city. The scooters are an interesting solution to the last mile problem and appear to be useful for a lot of people. However, the companies that are running the scooters have taken the approach that they’ll just “disrupt” transportation and simply do what they want and deal with the fallout and laws later. This has been a big topic on the news with injuries happening all the time, lawsuits (currently San Diego is facing a lawsuit about disabled access on the sidewalks), and some riders disobeying laws. 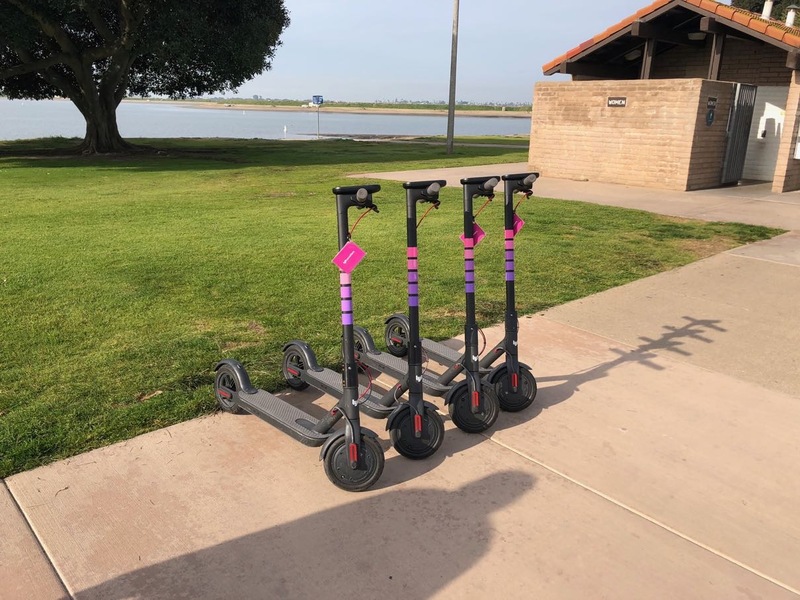 The San Diego mayor and city council have been working on ways to handle these scooters so that they can co-exist with everyone in the city. While this may seem like the right thing to do, I’d argue that instead of spending time trying to handle these scooters, how about taking a look at the problems they are causing and what laws already exist to handle them. Scooters are parked on the sidewalk either by the companies (or their contractors) or the riders. Scooters are being ridden on the sidewalk and the riders are getting into accidents with innocent pedestrians. Scooter riders are riding in the street in the wrong direction and not stopping at traffic lights and/or stop signs. Parent and child riding on a scooter. The scooters, themselves, aren’t the problem in my opinion. It is the riders (mostly) that don’t know what they are supposed to do or frankly don’t care. Let’s take a closer look at my list. While people may argue what is an adequate path, unless the sidewalk is really wide, a scooter on the sidewalk won’t allow 2 people to pass one another comfortably. A scooter is defined as a motor vehicle under California Vehicle Code and the path around Mission Bay is adjacent to a beach thereby making it illegal to ride a scooter on the path. Meaning that San Diego (as they have done) can regulate scooters on bike paths. As scooter riders must have a driver’s license (or permit) and scooter are classified as motor vehicles, the riders must follow all the rules of the road including which direction they ride on the street, stopping at stop signs or traffic lights, yielding, etc. This is already covered under California Vehicle Code. As I wrote in the beginning, I don’t have a problem with the scooters if they are operated in a safe and respectful manner (just like driving). I do, however, have a major problem with scooters blocking the sidewalk when parked and riders zipping by me when I’m walking on the sidewalk. In addition, driving is already dangerous enough without having to take into account a scooter rider on the road not obeying the law. Instead of trying to add more regulations for scooters, how about the city enforce the current laws on the books? This would go a long way at solving the problems. The companies that operate the scooters could possibly do more to make their riders understand how to properly operate them. As much as I’d like to blame these companies, it is the riders that are causing the problems. The companies, however, need to stage their scooters in appropriate locations to not block sidewalks and need to pick them up in a reasonable amount of time as they look like trash scattered all over. I am not a lawyer and this is not legal advice. This article is based on my interpretation of the laws. Where has time gone? I meant to write this article in December as it marked a year of me being self employed this time around. Anyone that has browsed my past articles will see that I’ve gone back and forth on being happy working for a company. Will this time being self employed be different? Will I be successful and happy? I believe that in any professional service work, having good clients is the key. For the most part, I’ve always had good clients and worked with good teams. For the last year, I’ve had a great client. I can only accept as much work as I can do personally. While I could subcontract out my work, I’ve never really felt comfortable doing that as I get my contracts based on my own work and not the work of a team. Having one main client means that if the client goes away, I’m left high and dry and have to immediately find another client. Taking time off is somewhat tricky as I don’t have anyone to back me up and I feel guilty about it. With the ability to purchase health insurance on the open market now, I’m not concerned with getting health insurance. This used to be a big concern of mine. The cost of health insurance on the open market is quite high but, I’m lucky that I can afford it. In the last 15 months, my large client has been great. I’m treated as part of the team and the team is made up of really good people. I don’t feel stressed and manage to get the work done when needed. I do feel guilty about taking time off (I’ve taken a few days off), but no one minds which is a huge relief. Being always reachable is both a blessing and a curse; I can’t be completely disconnected from work but my client can feel comfortable knowing that I can be reached. I really can’t ask for anything more from a client. People think that being self employed offers a lot of freedom. In reality it offers the perception of flexibility. I still have to get up every morning and work as I have commitments to meet and have to meet with my team. This is no different than working for a company. Given that, why don’t I just work for the company? That’s a good question. I feel that I’m in charge of my own destiny. Is that really true? I have no idea. When I was in middle school, our principal came to talk to the science club about HAM radio (yes, I was in science club). The most interesting part of his talk was when he demonstrated making a phone call via a phone patch. Since it was amateur radio, the phone call could be heard by anyone monitoring the frequency so it wasn’t a replacement for the phone. However, this made an impression on me, but not enough to get licensed. radio which is a cheap Chinese radio and figured out how to program it with CHIRP. I listened a bit, but never pushed the transmit button. and used an iOS app by the same author as the other app (the app is functional, but not pretty). I was extremely nervous as there is a lot of material that I just couldn’t wrap my head around. While a lot of the material was familiar (I have an engineering degree and studied electronics), I didn’t know if I would be able to do it. My wife kept telling me that I had nothing to worry about; she was right, I passed on the first try and only missed 5 (you can miss 13 or 50 and pass)! This time I’m determined to do something with my license. After my license came through the FCC, I decided to get a vanity call sign. The FCC dropped the fee for doing it a few years ago, so what did I have to lose? As an extra class operator, I had a lot more choices for call signs. Many people seem to like keeping their region in their call sign (California is region 6), but I just wanted something that sounded cool. My wife thinks that I’m a dork or a geek and keeps comparing HAM radio to CB by saying “breaker, breaker 1-9”. I’m OK with that, so I applied for and was granted KD0RK. Yup, I’m KD0RK and proud of it. to help with my radio and am waiting to try it out. My plan after getting used to local communications (through repeaters and such) is to explore HF. This is what interests me because I’ll be able to communicate without the Internet and talk to people all over the world. I read stories about HAM radio use in Puerto Rico after the hurricane and would potentially like to help out with something like that in the future. However, HF brings another aspect to the hobby that I have to learn including what antenna to get, what radio to buy, what frequencies to use, how does the weather affect propagation (yes, the manual went over this, but until it is used it is just theory), etc. Several years ago I wrote that I went gluten free to help with some intestinal issues. Doing that combined with my ulcerative colitis medicine has kept me in check for awhile. Unfortunately things changed earlier this year and my colitis acted up. When I was fighting my latest flare up, my wife suggested I look at changing my diet again. She is a great wife and did research to see what diets could help people with ulcerative colitis. She found the Specific Carbohydrate Diet and while it seemed quite restrictive, I felt like I didn’t have any other choice. I started this diet about three months ago and have been quite good at closely sticking to it. The basic gist of the diet is to eliminate grains, beans, and complex sugars. Looking at my diet prior to this, I had been eating a lot of grains, beans and definitely a lot of complex sugars! The hardest part of the diet started out being the sugars as I love sweets. I’ve replaced sugars with lots and lots of fruit as well as nuts. Luckily I live in San Diego and fresh fruit is pretty plentiful all year round. Going to the store is a different experience as I closely look at labels and look for things that really shouldn’t exist in my food such as sugar in the Kirkland Salsa or rice in the crunchy snap peas. One side effect that is probably pretty obvious is that I lost over 10 pounds on this diet not that I needed to do it. People have asked me if I feel better because of the diet. I guess the diet and the medication have made me feel normal again. I’ve always had a lot of energy and been pretty fit so that hasn’t changed. I have no plans to get off this diet as it seems to be agreeing with me. Watching what I put in my body is definitely not a bad thing and has made me more closely examine the labels for foods to see what hidden ingredients lie in our processed foods. I love writing software and routinely create programs to meet my needs. In many cases my applications are very focused and have a market of one, so I don’t bother polishing them or releasing them. There have been several exceptions to this including ReceiptWallet (now called Paperless and NotifyMail (NotifyMail was not quite consumer friendly, but did well in the enterprise). My latest application, MyNumberBlocker follows in the footsteps of my other apps in that it is very focused. This app is a one trick pony, but it solved my need to block the increasing number of phone calls that look like they come from the same prefix as my phone. When I started MyNumberBlocker, I was able to get it running very quickly and decided that I could use it as an experiment to see how the current App Store operates. As an individual I’ve only put one app on the Apple App Store and that was many years ago. Making the app user friendly wasn’t difficult, but took me awhile because I like tackling different types of problems and presenting a user interface with instructions was not fun. Another challenge was setting up a website and putting together some instructions. 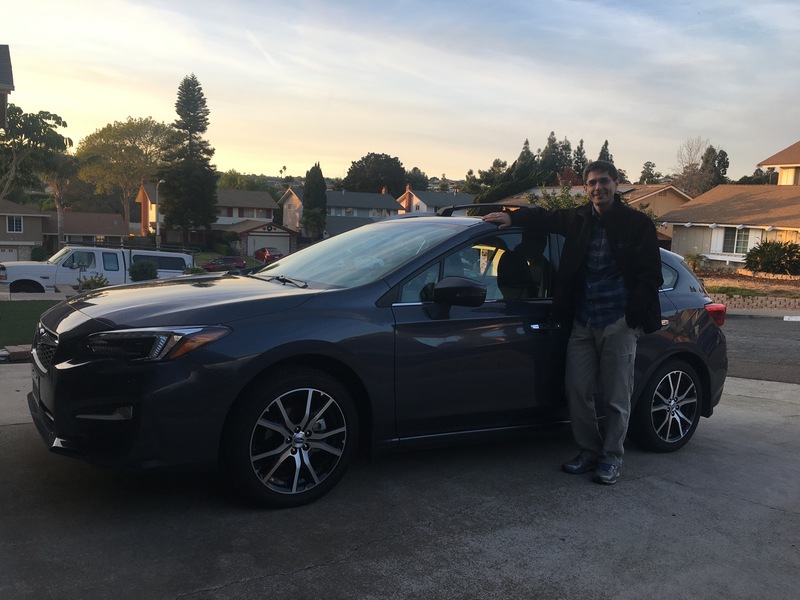 I know that MyNumberBlocker isn’t going to bring in enough money to change my life so I’ve set a very modest sales goal. The next step is figuring out how to market the app with little to no marketing budget! When I started to see rumors about the 4K Apple TV, I decided that I wanted to jump on the 4K/HDR bandwagon. While there is nothing wrong with my 4 year old Vizio TV and 5.1 soundbar system, I enjoy watching TV and wanted better picture quality (yes, I know I need content and will pay an additional $2/month for Netflix 4K). Since I have been generally pleased with my Vizio M Series TV, I was looking at getting the new M Series that did 4K and HDR. With that decided, I wanted to move to a slight annoyance I have with my current setup. This annoyance is minor and has to do with controlling sound. Since the Apple TV and my TV support HDMI CEC (consumer electronics control), I can turn the TV on and off with the Apple TV remote. Furthermore, the Apple TV remote can control the volume on the soundbar via IR. This setup works, but requires that I aim the remote at the soundbar to control the sound and sometimes takes a few tries because something is in the way. I had heard about HDMI ARC (audio return channel) which would let me plug a soundbar into the TV via HDMI and route all the audio that way. In addition to just routing the audio, this would give me CEC for the soundbar bringing my dream of one remote to control everything. Off I went to look for a soundbar that met this criteria. I picked up the Vizio SB4051-D5 at Costco and it appeared to meet my needs. I was able to control everything from one remote and was even able to change the volume using the Apple TV remote app on my phone or iPad. My joy faded fast when I started looking at putting 4K/HDR into the mix. The Vizio M Series TV has 4 HDMI ports, put only HDMI 1 supports HDMI 2.0 which supports the latest 4K/HDR standards. In addition, only HDMI 1 supports ARC for audio. OK, no problem I thought; plug the Apple TV into the soundbar and the soundbar into the TV, all via HDMI. This works fine for HD, but once I got down into the specs, I realized that the soundbar would have to pass the 4K/HDR video signal to the TV. None of the Vizio soundbars do this today. Soundbar goes back to Costco. Now I’ve resigned myself to waiting for better options. However, in the meantime, I started looking at a company I’d never heard of, TCL and their P series TV. With 3 HDMI ports that support HDMI 2.0 and 1 of those supporting HDMI ARC, it looks like I still may well be able to realize my goal of 1 remote; the Apple TV would plug into HDMI 2 and a soundbar into HDMI 1. In addition, the TCL has Roku built in; I used Roku prior to the Apple TV and was generally pleased with it, so that’s a bonus. Where do I stand? Well, I’m going to take a closer look at the TCL TVs and just sit tight for awhile before I make a purchase. I am still going to look at a new soundbar after I get a new TV. Any advice on new, budget 4K/HDR TVs? Up until a few years ago, I spent most of my career writing software that was used by consumers. This was very satisfying as it was easy to explain to others what I did and in many cases, they’ve heard of the software such as Eudora, PayPal, or eBay. With the rise of the smartphone, everyone and his dog is learning to write software and hopes to strike it rich on the App Store. Many developers, it seem, think that the exciting software to write is this type of software where the developer can earn a name for herself or himself. Through a few changes in my positions at a company, I started working on retail software that would be used by store associates and would never be seen by consumers. At first this seemed pretty boring as enterprise software is typically very utilitarian and doesn’t get to use many features of modern smartphones. Now that I am fully immersed in enterprise software, there are some key advantages to it over writing consumer software. All devices running the software get the same app version using MDM (mobile device management); no worrying about people running old software. Limited number of users makes it easier to train people to use the software. Bugs can be fixed and features added very quickly without App Store approval process. No one writes reviews of the software that hurt your feelings! You don’t have to worry about marketing a $0.99 app and the race to the bottom in pricing. With more and more iOS devices being used in enterprise, there are huge opportunities for development. It may not get me fame or fortune, but it is currently my path to a decent living!